Want A Private Jet? Mexico's Next President Has One Up For Sale Andrés Manuel López Obrador, known as AMLO, vowed that if elected he would fly commercial — not on the presidential jet. As his inauguration approaches, he's looking for a buyer. 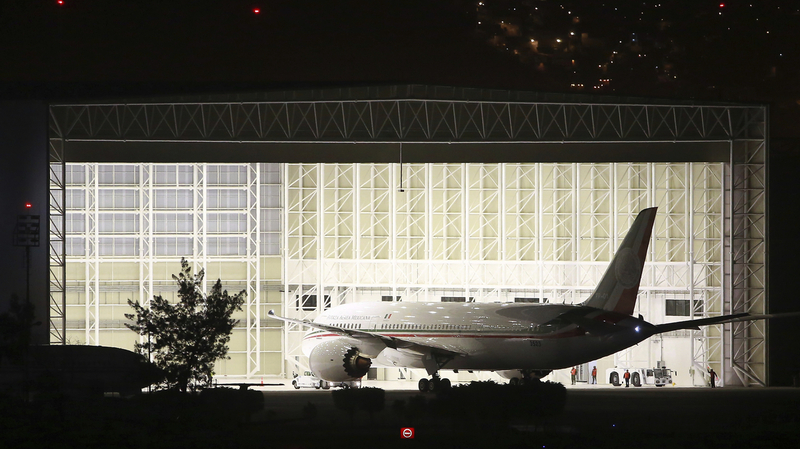 Mexico's presidential plane, a Boeing 787-8 Dreamliner called the Jose Maria Morelos y Pavon, arrives at Benito Juarez International Airport in Mexico City in February 2016, when it was brand new. The airplane was one of the most expensive presidential airplanes in the world. Mexico's next president is trying to sell it. The Boeing 787-Dreamliner is big, luxurious, nearly new — just two years old. It's downright presidential, since it was built to transport a head of state. The president-elect of Mexico doesn't want it. Not even a little. But that doesn't mean he can't praise it. In fact, he has a whole sales pitch. "It's not just efficient and modern," President-elect Andrés Manuel López Obrador, who's widely known by his initials, AMLO, told reporters on Friday. "It's a comfortable plane, with a bedroom, a restaurant, lots of space." If you set it up like a passenger jet you could fit 280 people, he notes. Plus, it's famous! And if you want it, it's yours. For a price. López Obrador ran for office as a leftist populist who said he'd crack down on corruption and slash his own salary — while also capping other public officials' pay and eliminating perks of government employment. Ditching the presidential jet, purchased by his predecessors for a pricey $218 million, was one of his campaign promises. As he approaches his inauguration in December, he says he hasn't changed his mind. In fact, López Obrador has decided to sell — or rent out — a whole slew of airplanes and helicopters owned by the federal government. "We aren't going to use this fleet," he stated firmly in August. The profits from selling or leasing out the planes and helicopters would be directed to social programs, he said. At a press conference on Friday, López Obrador asked the gathered journalists to help him get the word out to potential buyers. With a twinkle in his eye, he expounded on the virtues of the plane, which is called the "Jose Maria Morelos y Pavón." "If you want to buy it, I'll deliver it myself," he said. "We'd have a ceremony. And you'd be traveling on a very important airplane. "It's not just the cost of the plane, the value of the plane, the usefulness of the plane: It's the fame." He did add the caveat that it would cost about 500 million pesos — some $25 million — to maintain the plane each year. Possibly remembering that the crowd of journalists were unlikely to be footing that bill, López Obrador asked them to spread the word. "Help me transmit this call, so it travels all around the world," he said. "There may be people who are interested." In 2016, before the arrival of the brand-new plane, the Mexican government emphasized that a presidential plane is important not just for the safety of the president, but for efficient transportation of the press corps that travels with him. But López Obrador has been adamant that it's an unnecessary luxury. As president-elect, he's stuck to that position. Frequent fliers will not be surprised to hear that it's already proven inconvenient. In September, he spent hours grounded on a commercial jet delayed by weather — ultimately, he spent four hours waiting for a one-hour flight, Reuters reports. "Official flights can also be delayed by bad weather," the wire service notes, "but they have priority to land when the weather clears." "I'm not going to change my mind because of this. I'm never getting on the presidential plane," López Obrador said at the airport, according to Reuters. "I'd die of shame to use such a luxurious plane in a country with so much poverty."